>are being done here amongst the sewing. This photo was taken at the weekend and they have grown since then. 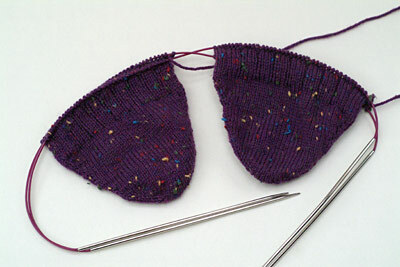 The yarn is Knit Picks ‘Essential Tweed’ in Plum which I think is discontinued now. It came from deep in my stash and was a present from my friend CL in Canada a few years ago. It’s a lovely soft yarn but hopefully will be strong due to the 25% nylon content. I’m using 2mm needles for a nice dense fabric. >cute toes! they are going to be great socks! >What a lovely looking yarn – two at a time is definitely the best way to go – makes me think about getting my socks out again (the the yarns not a patch on yours).